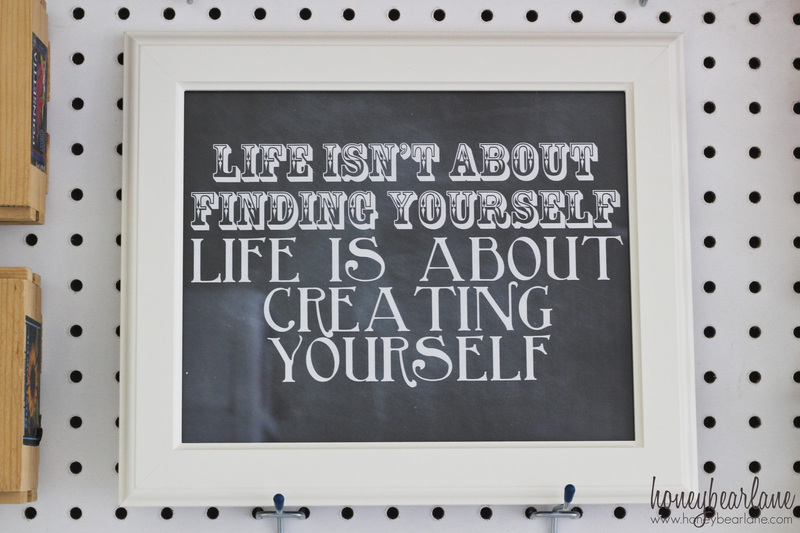 Last thing I put up was this framed quoted “Life isn’t about finding yourself, Life is about Creating Yourself.” I love this quote because it reminds me of the me I am now and the me I was as a lost college student. I remember how important it was to me to “Find Myself”…and yet the person I am now is definitely someone I have created. And my creativity and need to create is a HUGE part of me. I’m never content if I couldn’t be creating something. This pegboard is 6 feet by 4 feet and framed with crown molding. It’s hung in a way that allows me to remove whatever I want with ease or rearrange or whatever. It takes up nearly the entire wall and I actually really like what it brings to the whole living space. Why should I hide such a big part of my life? Um, because it’s seriously messy most of the time? I LOVE your pegboard! 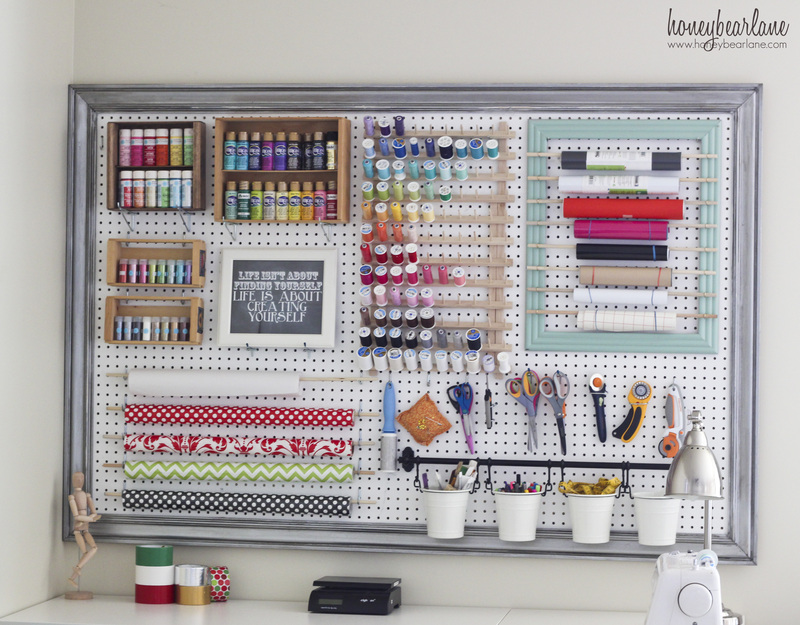 I’ve been wanting pegboard in my sewing room, but I never thought of making it so pretty! I also love the way you “framed” your rolls of vinyl. Such great ideas! Thank you!! Thanks–it really has made my life so much easier. I knew this would be up on the wall for all to see so I wanted to make it as attractive as possible. Thanks! This was the largest project I have ever attempted. I have to say the manual mitre saw about killed me. It turned out pretty good. I was a little off on placing the crown molding on the peg board. It was not lined up exactly but it’s good enough. I wasn’t sure from the instructions on where to mark the crown molding but I figured it out. 1st I tried to glue the frame and then place it on top of the peg board but when I tried to lift the frame it came apart. I did have fun playing around with the color and antiquing. I also used Martha Stewart paint. My next attempt is hanging it on the wall. I had originally bought $300 worth of Elfa (I’m a big fan) but after seeing your peg board I liked it a lot better, returned the Elfa, went to Home Depot and spent about $60. Your has a more homey feeling. It took a lot of arm strength sawing. Later I found out my dad had an electric saw. I’m excited to get it hung and display all of my stuff. I do need to make a trip to Ikea for the buckets. Thanks for the inspiration. I thought I would take the 2×4 piece and frame it but I’m not sure after my sore shoulders! I loved reading about your project! It is super hard to cut that by hand. I just made another one this week and my hand is still sore haha. I can’t wait till I buy my power miter saw! Glad you saved the money and have a custom piece now! Would love to see a picture of yours!! good morning, we need to know where we can buy the pegboard in Spain, if there is any wholesaler or distributor ?? I honestly do not know. Just go wherever you would go to buy lumber and they might be able to help you. Looks great! I just hung a giant pegboard in my brand new basement craft corner. Heidi, this is such a beautiful craft area! I love that you’re not hiding it away, you’re using the space you have. It’s gorgeous. And you have so much great crafting stuff. You’ve done such a nice job with it. Makes me want to go work on my “space”. Thank you! I have SO much more stuff than this but at least some of it is neatly displayed instead of shoved away in a plastic bin. This looks SO pretty! I’m loving that vinyl storage frame, and that glitter display is beautiful! Glitter doesn’t take much to be beautiful! Thanks Bev! Just left a comment on your cute TV console redo! This is fabulous. Can I ask how you hung the Ikea buckets? I can see that most of the other pieces are hung using s-hooks or hooks specifically made for the pegboard, but I can’t tell about the rail for the buckets. Thanks. I just drilled the screws right in the space between the holes and hung the bar up that way! They are from IKEA but you can find them on Amazon too, here. LOVE this! I’ve been wanting/needing to do some organization in the craft corner of my office. This inspires me! Thanks! Hope you can get it like you want! Best use and prettiest peg board I’ve ever seen. This is great and framing it out is perfect. I should configure something like this for all “my Stuff” Thanks! Heidi, This is beautiful! I have seen LOTS of pegboards because I am in the process of cleaning out/rearranging my craft room that was my home office for a business. I retired from that business last July. I am glad I waited to hang a pegboard so I can do THIS! Can’t wait to see how you made it! Thanks for sharing! I have a pegboard just that size that stretches across our dining room, giant thread rack and all! Though mine is far less organized. My favorite additions have been a mail box (the ones that hang on the house) to hold all my bias tape and ric rac packages, and a screwdriver holder that corrals all my different scissors. You’re definitely right about not knowing what you have until it is all out in the open…I never knew I had so much “stuff”! Wow! That is beautiful! Are you serious? Your kids stay out of that? Haha yes! I think since they grow up seeing all my crafting stuff every day it’s not as mysterious and exciting. I also put the paint up high. This is fabulous! Cute, organized, functional… everything in one! I need some crafty supply organization desperately! Thanks so much for the inspiration! Have a great day! What a fabulous idea for organizing a craft area. This will be great when I get my craft room back. It will be great to have it all up on the wall instead of in boxes and drawers. I’m currently looking for ideas to organize my craft stuff. This looks great! LOVE your craft pegboard organization! Love everything about it. You’ve inspired my to cleanup my craft space (again) 🙂 I’m featuring your pegboard at the PoPP Spotlight this week. Thanks for joining the party. I have been collecting items for a craft room for the last 6-7 yrs. Due to an illness, i was put way behind! Anyway, i am thinking that i might be able to tackle this project this yr. So, i will keep my fingers & toes crossed . This would look great & make a great ‘WOW’ starting point. Wow, I hope you can get to this project this year too! Best of luck! I love this! Where did you get those wine boxes from? It’s the mother of all pegboards! i love it. I’m building my own craft room and am planning a pegboard organizer over one of the desks. I’ll definitely be taking some pointers from this one! I love the use of crates and the picture frame vinyl holder. Those Ikea buckets are awesome too. I’d love it if you linked this to my new linky party! Welcome to my blog Becky! I hope that you can be inspired by some of my projects. I too have a peg board in my stamp room and I love it, but it’s not as put together as yours!! I love how you organized your things!! Thanks for sharing!! This is absolutely amazing!! I have serious organization envy right now. All of my supplies are in boxes all over the house. Just got my pegboard! I have molding left over from when we re-did the house, so it can match the door frames. 🙂 can’t wait. thanks for sharing your great idea. I love this! I am repurposing an old armoire for my craft/sewing storage and i am using this for my inspiration. Did you purchase the thread holder or make it? If you did purchase it….where? I just found your blog at “I’m an Organizing Junkie” and I LOVE this peg board for the craft room. I am working on re-doing my Craft room walls and this is GREAT inspiration. This is looks amazing Heidi! LOVE it! Thank you Tonya! Your spring stuff is all amazing! This is amazing! You are so good at being crafty! I have an empty peg board already hung…waiting to be useful.. Thanks for ideas on what and how to hang! Oh do it! This pegboard has changed my life! Hi! I ran across your post while searching craft storage for small spaces, when I saw your board I knew I had to have one of my own! I went to lower yesterday and bought the supplies (including the saw! ) I think I ran into a problem with the building of the frame, I used too much gorilla glue but I’m gonna give it another try. Can’t wait for the results 🙂 thanks for the inspiration! I seen your blog address on the Quilting Board, its nice to meet you, I love your peg board. I just rearranged my sewing room & I was thinking on how to make the best use of it, as I want to hang my scissors etc, and my interfacing & stabilizers. What did you use to hang the rod & buckets on, and rolls of paper in that picture frame, I only have the straight hooks to put the scissors on. I am hoping to hear from you so I can go shopping. I did not paint the small one I have hanging, my DH screwed it into my wall, so I hate to take it down, but when I put up the larger one, I am thinking of painting it a pale yellow, as my wall are white. I look forward to hearing from you. The details are all in the post but I got the buckets at IKEA. Hi! I found your pegboard through a web search while looking up ideas for my craft room. I love it, my husband is working on it as we speak!! I know you’ve said you got he buckets at ikea but do you by any chance know the name they go by? Or even the department they are in? I have been looking all over their website trying to find them and I can’t. Any information would be appreciated. I’d hate to walk the 47 hours it takes to get through the store and not find them. The professional look they have is what made me click on your picture. Thanks in advance! I don’t know their name but they are in the kitchen section of the display area–not the marketplace. Hi! I just looking for black polka dots wrapping paper do you know where i can buy it? I bought mine at Tai Pan Trading. Two of them were hung with a specific pegboard hardware that sticks out about 6 inches so the box can rest. The glitter ones have slits in the back that the shorter pegboard hardware holds them up. If you purchase a pegboard hardware kit you should be able to find something that works! Can you PLEASE tell me where you got the thread holder for the pegboard? I am going to make this for my mom for Christmas!! I just got it at JoAnns–they sell various sizes. Good luck! Also, how did you mount this whole board on your wall? Our condo walls are thin and stud less and I am worried something like this wouldn’t hold. Did you paint your pegboard white or did it come like that? I have seen only wood colored ones at home depot. There is a full tutorial on how I did everything, just click the link at the top of the post. WOW!! I am 11 years old and I have so much art supplies because I love art SO much. I have my own art room and I am not very fond of keeping all of my supplies in tubs and bins! This is a fun, cute, and easy way to make it all look awesome!! I will have my dad get all of this stuff right away! Cool! You’re gonna love it! I found you via Jen at IHO. Can you tell me where you found the quote in the frame? I love everything about this!! I think I just found it on pinterest–sorry not much help! The Ikea rail and buckets are called FINTORP . . . I am in the process of doing a craftroom redo as well, but I am unable to attach anything to the walls because of the finishing system we used in our basement, so your pegboard idea actually helped me realize that I could do the pegboard if I used a stand set-up at the bottom . . . will let you know how it turns out! Hi. I love this board and am working on my own. How did you attach the Ikea system to the peg board? I just bought it today. Thanks! I LOVE this peg board and am working on one of my own. How did you get the Ikea bucket system to stay on the board?? Thanks so much!! I think I just acted like the pegboard was the wall for the screws and screwed it into the pegboard. Thanks so much! What a great compliment! I love my pegboard and it has seriously changed my life. I found your blog from Pinterest. My husband helped me to make this yesterday though mine is not exactly the same. I was wondering which hooks you used to hang the thread holder and the dowels for the wrapping paper? I can’t see them very well in the photo. I have many of my things hung up but not these two as I was not sure which hooks to buy. thanks! You have a lovely blog by the way and I will be stopping by often. I just bought the pegboard hardware kit from Home Depot. It comes with a ton of hooks and other pieces. To hang the thread holder and wrapping paper I used the large L shaped hooks. Would you be able to share a link for what ikea product you used for the bar and buckets? Good Morning Heidi, I have just discovered your blog after visiting some one else and I am so pleased I did because I am looking for ideas to use in my sewing room. I had thought about using a peg board, but I love how you have framed yours. I am so excited to start this project….. well perhaps not me…. my husband. I just know it will look fabulous when completed. Thank you! I adore my pegboard as it is literally the only thing that is consistently organized in my house! Good luck with yours! Love this board!!! I want to make one for my sewing room, and when I showed this post to my husband he said he want one too, for his bike lab! Great idea, thanks for sharing! 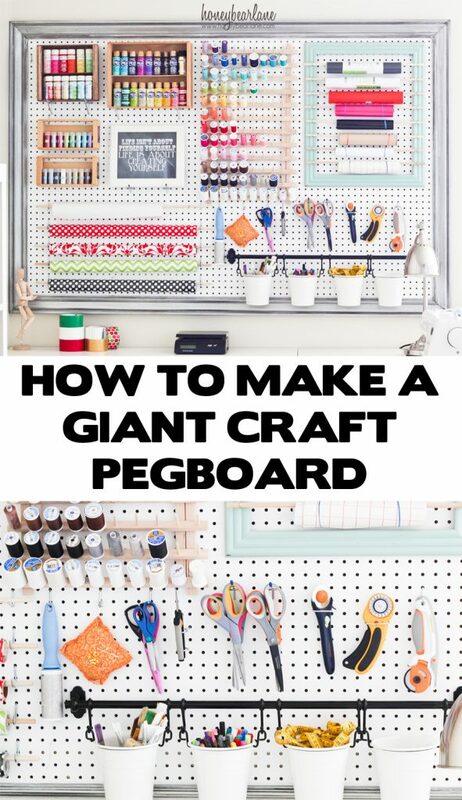 I will just like to join to what Maryann (@ Domestically Speaking) says: .. about this Extra Large Pegboard for Craft Room Organization… It is a great idee … it is an art :))))))) LOVE IT! This is exactly what I need to do. I have a small craft room and like many, I have stored items I can’t locate. Thank you thank you for your awesome idea!! Hepa Vacuum Buying Quick guide – The best ways to choose a hepa vacuum cleaner, and a helpful vacuum function checklist. What did you use to hang the thread thing and the frame? Love this! Thanks! I used a hardware kit specifically for pegboards. Love you peg board! Where did you get the box that holds your glitter? Also, how did you get the glue gun to stay on the board? The box is just an old wine box I found at a thrift store. And I’m not sure what you mean by glue gun…I don’t have my glue gun on the peg board. I do so many crafts I find it very hard to keep all my different things organised, this is such a wonderful idea that I’d certainly love to do it, my problem would be the size since the only place I can put it is my bedroom which isn’t large and already has more than enough crammed into it. It would be easy to customize the size, just have the store cut the pegboard down for you! This is exactly what I need in my craft room/office. I just do happen to have a great big frame I diy’ed into a chalkboard but I never use it. Storage is what I need. Thank you for this post! Sure thing! This craft pegboard has been immensely helpful in helping me access all my major craft supplies easily. Good luck! Im going to do this.. Thanks with great directions. One questions… How do you attach shelving to the peg board – like your wine crates. Are the peg board hardware hooks work or you screw them all the way through peg board.. Their is a etsy store that has some pine floating craft paint shelves or spice racks? Advice on this… Wont use sewing thread or wrapping paper. Vinyl rolls and paper towel holder. The peg board hardware kits come with large brackets that I just rested the wine crates on. The hardware is very easy to use, just poke the hardware through the hole and it rests there. Great idea! I am sharing this on Pinterest. could you please give us the detail of the thread holder? I’m gonna make something like that bcause i can’t find in store in Indonesia. I’m sorry, I didn’t make it. You could probably order one online though. I’ve been wanting to make one of these for SOOOO long. I think this finally inspired me to do it!! Thanks for sharing! They are simply resting on a couple of L shaped hooks! There is clearly a bundle to know about this. I feel you made some good pointrs in features also.